Empa's Electron Microscopy Center located in Dübendorf offers electron microscopy services to internal and external R&D partners. The center conducts forefront research in the development and application of new electron microscopy techniques in materials science and acts as a consulting unit for electron microscopy in materials science. The staff of the center carries out research tasks on-demand, offers training and provides hands-on support for practical applications. Liquid cell TEM: Control of the growth mode of gold nanoparticles (FEI Titan Themis with Protochips' Poseidon holder). The center operates transmission electron microscopes, scanning electron microscopes and facilities for specimen preparation. Besides convention electron optical imaging (TEM & SEM), the instrumentation can be used for environmental and low-voltage SEM imaging, electron diffraction, atomic-resolution imaging by HRTEM and (aberration-corrected) STEM (Z-contrast imaging), and for analytics, covering high-efficiency EDX spectroscopy (TEM & SEM), electron energy-loss spectroscopy (EELS) and energy-filtered imaging. A list of the available instrumentation can be found here. Our expertise comprises various imaging and in particular atomic-resolution microscopy techniques in the broad-beam and the scanning transmission modes, core-loss and low-loss electron energy-loss spectroscopy as well as electron tomography, in-line and off-axis electron holography for mapping electrostatic and magnetic fields at various length scales as well as differential phase contrast STEM, which provides an alternative method to access electrostatic or magnetic information about the specimen. The experimental work is complemented by image simulations and by first-principles theoretical approaches to calculate electron energy-loss spectra of model structures. For the different simulations, software packages and workstations are available. Some of our recently started activities focus on in-situ measurements in (S)TEM using MEMS-based liquid-cell and biasing/heating specimen stages. More information about our research activities can be found on our project website. For our in-situ activities visit the website of our CLUSTER project. 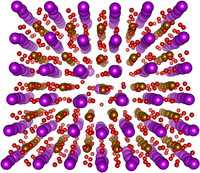 Tomographic reconstruction of a nanoparticle (JEOL JEM2200fs). Members of the electron microscopy group work on various research projects involving functional oxides, novel heterostructures for future semiconductor devices as well as in-situ and electron-holographic methods . Atomic-resolution STEM/EDX elemental maps of a multilayered system consisting of SrTiO3 and LaAlO3 (FEI Titan Themis). Our latest article: highlighted as Editors' Suggestion in Physical Review Materials: Structure and properties of edge dislocations in BiFeO3 (March 2019). Congratulations to Trond Henninen! Poster award for "Temperature dependent quasimolten crystallinity of sub-nm Pt and Au clusters observed in 3D by fast dynamic STEM" at ELMINA 2018 in Belgrade, August 2018. Roksolana Kozak successfully defended her PhD thesis at ETH Zurich on 12 July 2018: Integration of GaAs on Si Nanostructures. Congratulations, Dr. Roksolana Kozak! PhD thesis Nr. 4 of Empa's Electron Microscopy Group. First liquid-cell S/TEM study published in Chemistry of Materials: Formation of Au Nanoparticles in Liquid Cell Transmission Electron Microscopy: from a Systematic Study to Engineered Nanostructures, by Yucheng Zhang, Debora Keller, Marta D. Rossell and Rolf Erni.